The new Canyon Inflite AL SLX 6.0 Race, the German company's most affordable cyclo-cross race bike thanks to a new aluminium frame, has all the fantastic handling and performance of the carbon Inflite at a much more appealing price. The performance of the new Inflite AL SLX 6.0 Race is highly impressive. I was left in deep admiration after testing Canyon's first attempt at a proper race-focused cyclo-cross bike last year, and thankfully none of that performance has been lost or even diluted with this aluminium-framed version. In fact, without riding both bikes side by side, I'm minded to say that this bike feels just as fast and capable. It's a little heavier on the scales, but in the scrap of a cyclo-cross race, the courses of which are largely flat, the weight isn't really an issue. It doesn't feel heavy when you're accelerating down the back straight or when hefting it over your shoulder to jump over hurdles. There's a little less 'snap' when getting on the pedals to accelerate back up to speed when exiting a crawling-pace hairpin, but the aluminium frame and carbon fork (the same as used on the more expensive Inflite) provide the necessary stiffness to ensure it's generally a very responsive and direct bike. Canyon has wisely replicated the same geometry as the carbon Inflite. Compared to a regular road bike, the Inflite has geometry that is slacker with a 72.5-degree head angle and a longer wheelbase (1,018mm on this medium), both changes intended to produce a calmer and more relaxed ride at high speed and when tackling loose, unpredictable surfaces. To further increase the stability factor, Canyon has increased the reach in tandem with speccing shorter stems, the latter serving to keep the steering nimble. To test the Inflite properly I had to take it to a cyclo-cross race, so I entered a local evening floodlit series (shout out to the Supermarine CX), the ideal way to put it through its paces. And while my result won't set the world on fire, the bike was more than capable. It was easy to get it through the many, many tight hairpins, it was smooth along the two fast grass tracks, and accurate through the tight tree-lined singletrack sections. Away from the lung-busting, blood-tasting demands of racing, it's capable on my regular bridleway bashing off-road route that I use to test adventure bikes. You can't take the same liberties with the narrow tyres as you can with the fatter tyres of gravel bikes, and higher pressures are needed to ward off flats, but it's more than adept at dealing with whatever trails the English countryside can throw at it. It's a little over-geared for this sort of riding, specced as it is for racing, but there are two sets of bottle cage bosses for longer rides. Canyon might be best known for attractively priced carbon frames but it knows the value of a decent aluminium frame, too, and this is a very tidy looking aluminium frame. Canyon has replicated both the geometry and the visual cues of the carbon Inflite, but the distinctive kinked top tube has been softened. I do wonder if Canyon could have just straightened the top tube completely, but then it would have lost this distinctive silhouette. The main tubes are oversized for stiffness, there's a tapered head tube with the full carbon fibre fork borrowed from the carbon Inflites, and the seatstays are dropped low down the seat tube. An external seat clamp replaces the internal clamp on the more expensive bikes but is no bad thing in my opinion – it's much easier to use. As you might expect in this day and age, the Inflite AL SLX is only available with disc brakes and it uses 12mm thru-axles with flat mount callipers. All cables and hoses are internally routed, and while this bike has no front mech, there is provision for fitting one if you wish. Tyre clearance maxes out at 35mm, as it's entirely designed for racing and the UCI's maximum tyre width limit is 33mm. There's reasonable clearance around the tyres and I had no issues with mud (what mud there is at the time of writing) clearing between the tyre and frame. As with the carbon Inflite, Canyon has ensured there are no areas where mud can collect on the frame, and has done away with the seatstay and chainstay bridges. 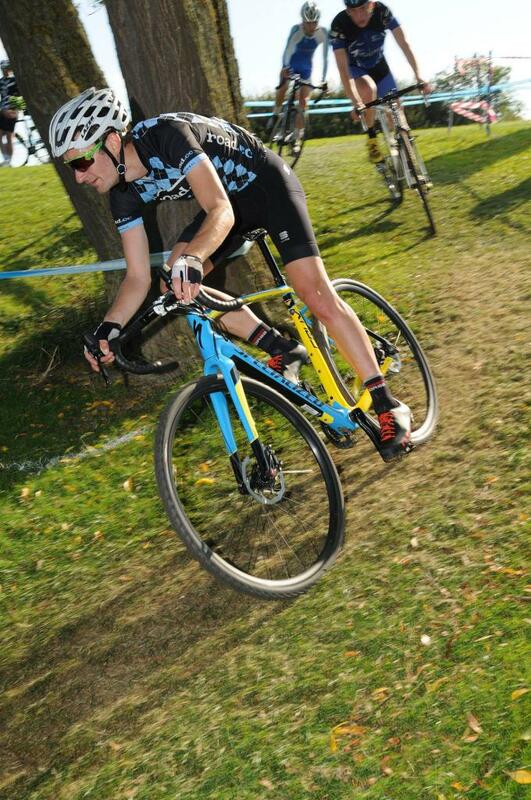 Clearly, the Inflite isn't intended as a versatile cyclo-cross/adventure bike. There are no mudguard or rack mounts. And it really won't take wider tyres – I tried. I fitted a set of 40mm tyres to test and the front cleared, the rear didn't, with the tyre rubbing against the chainstay. For that sort of extra versatility you're going to have to look at the company's Grail, though a set of 35mm tyres would open it up for more general bridleway exploring (can 2mm can make a difference? – discuss). Browse the catalogues of some companies' cyclo-cross bikes and you'll spot a lot of SRAM groupsets. The US company has enjoyed considerable success and popularity with its 1x hydraulic disc brake groupsets, and for good reason: it shifts well in all conditions, is reliable, provides a wide range of gear ratios and the brakes are powerful. Fitted to this £1,299 bike is SRAM's most affordable 1x groupset, Apex, which borrows all the key tech from Rival and Force. That means a clutch-style rear mech and thick/thin chainring, which together do a good job of preventing derailment of the chain. The shifting is easy – just one paddle on the right-hand side lever – and the disc brakes are powerful and quiet. The setup of 40-tooth chainring and 11-36 cassette was ideal for cyclo-cross racing. The DT Swiss C 1850 Spline DB wheelset combines 22mm internal width aluminium tubeless-ready rims with 370 aluminium hubs employing a three-pawl freehub for quick engagement. They're not the lightest at a claimed 1,745g, definitely an area for a future weight-saving upgrade, but put in a respectable performance and are more than up to the task of taking a battering. Tyres are critical in cyclo-cross, but the decision to fit the Schwalbe X-One Bite Microskins is a smart one; these are £120 worth of tyres, too. Too often I see brands fit low-profile treads better suited to commuting than the reality of UK winter cyclo-cross racing. As the tread pattern indicates, the X-One Bite is designed to excel in the mud, which it certainly does, with enough grip to keep you from getting bogged down. It's perhaps not the fastest rolling tyre on a bone-dry course but for anyone short of pro level or super-serious 'cross enthusiast, you're not going to lose out much at all. The only downer on the tyres is that I ripped the sidewall on a more adventurous outing (I got a bit carried away on a rocky descent), which serves as a reminder that there are limits to how hard you can push skinny cyclo-cross tyres. You can read a full review of the tyres here. Best of all, both tyres and wheels are tubeless-ready. You'll have to set them up tubeless yourself, but kits are easy to come by and making the conversion is pretty straightforward. I'll only ride tubeless when I race cyclo-cross and so far (touch wood) I've not had any issues or concerns. Finishing kit is all solid no-nonsense stuff: an aluminium stem and handlebar with a VCLS carbon fibre seatpost with 25mm of setback, topped off with a Selle Italia X1 saddle. The carbon seatpost is designed to provide a bit of extra deflection to aid comfort on rough ground, and the gel handlebar tape provides a bit of extra cushioning as well. The Canyon Inflite not only impresses on the race course, it's also really good value, which is pretty much as we've come to expect from Canyon. But how does it really stack up? Very well when you compare it to the £1,700 Specialized Crux E5 Sport, which also pairs an aluminium frame with a SRAM Apex 1 disc brake groupset. For the same price as the Canyon you can get a Giant TCX SLR 2, which also combines a SRAM Apex 1 groupset with an aluminium frame, though the crankset is downgraded to an FSA Omega item. I've ridden previous TCX bikes and they've offered a similarly good level of performance and handling to the Canyon. For maximum value, the £1,000 Boardman CXR 8.9 looks hard to beat on paper, with an aluminium frame adorned with a SRAM Apex 1 groupset, but I haven't ridden that bike so can't comment on its performance. The other option is to spend another £500 on the Inflite CF SL 7.0 Race. As well as the lighter carbon fibre frame, which produces a substantially lighter bike on the scales, you also get the slightly posher SRAM Rival 1 groupset with a power meter-ready crankset. Is it worth the extra? I think it depends on your cyclo-cross ambitions. If you just want to race for fun and fitness, the Inflite AL SLX 6.0 Race really won't hold you back much at all, but if you have an inkling you'll become seriously intoxicated with the sport, the Inflite CF SL 7.0 Race represents a good long-term investment with more upgrade potential. The Inflite AL SLX 6.0 Race is a fantastic, fast and highly competent entry into the exciting world of cyclo-cross racing, with race-proven handling and a really good equipment package that will help you to unleash your best performance on the race course. And did I mention how great the Hot Mint paint job looks? Canyon says, "Our entry into the world of cyclocross brings the standout features of the multiple award-winning and race-proven Inflite CF SLX to aluminium level. The Inflite has been ridden from win to win by cyclocross superstar, Matthieu van der Poel. Now, the Inflite AL SLX brings you professional performance at an entry-level price thanks to the same race geometry. A high quality aluminium frame, Sram Apex one-by drivetrain, flatmount disc brakes, full carbon fork and through axles – this is performance without compromise." It's the entry into Canyon's cyclo-cross race bike range, and the only aluminium model currently available. Very nicely made aluminium frame and carbon fork. Some of the welds around the bottom bracket aren't the smoothest I've ever seen though. Aluminium frame and carbon fibre fork. First things first, the geo is the same as the more expensive carbon Inflite, and that's a good thing as I found it generally worked very well. Compared to a regular road bike, the Inflite has geometry that is slacker with a 72.5-degree head angle and a longer wheelbase (1018mm on this medium), both changes intended to produce a calmer and more relaxed ride at high speed and when tackling loose, unpredictable surfaces. To further increase the stability factor, Canyon has increased the reach in tandem with speccing shorter stems, the latter serving to keep the steering nimble. It's available in eight sizes from 3XS to 2XL, with the smallest two frame sizes built around 650b wheels. The geometry has also been tweaked on these two smallest sizes to maintain the desirable handling, with reduced trail, a steeper head angle and shorter wheelbase. I found the fit just about perfect. The reach is a little longer and designed around a shorter stem to enhance the handling. Impressively comfortable for an aluminium frame. Noticeably stiff when you get the power on out of a slow corner. Adequate power transfer for getting straight back up to speed. How would you describe the steering? Was it lively neutral or unresponsive? Nimble and calm. The handling is the right balance of agility and stability for dealing with both tricky slow speed corners and fast descents. The saddle isn't my fave but I could live with it for an hour-long race, but I'd probably look to change it at some point. All good apart from the saddle. The finishing equipment is all good solid kit, with short reach drops and a short stem promoting agile handling. All the component choices are sound and sensible. Compared to other bikes on the market, the Inflite is really good value for money, and the performance is equal to bikes costing a lot more. Not only is it a good entry-level cyclo-cross race bike, it's a good choice for racers of any level, and the money you save can be put towards race entry fees and petrol. The Inflite AL SLX 6.0 Race is pretty close to flawless really. Some of the frame welds could be tidier, and the wheels could be a bit lighter, but it all comes together well to perform brilliantly in a cyclo-cross race. Are Bianchi getting any royalties?? What would You think about using this bike as an all-round bike for both paved roads and offroad tracks? Can you post a pick of the rear disc <-> frame clearance? I have an older Inflite, the clearance is sooo small that I have scrated the frame loads when removing the wheel. Makes me sad, as otherwise it's a great bike. I would like to see some pics of bottom bracket area and its finish. Thanks! Pic 13 in the gallery shows the BB area up close - you should be able to scroll through. It's such as shame that Canyon seem allergic to mudguard mounts as either this bike or the Endurace would make lovely winter bikes but for me, the capacity to mount proper mudguards is non-negotiable. I understand that but the trouble is that the cheapest Grail is £2000 which for me is way too expensive for a long commute/winter bike. The cheapest disc Endurace or this bike are both at the £1300 mark which to me is a far more acceptable amount for a winter steed. From a purely aesthetic point of view I'm not a fan of the double handlebar on the Grail. I'm also keen on the idea of a Cross bike that can perform a double role of cross racing and also winter club rides with a quick change of wheelset and whipping the mudguards on and off. My height = 179 cm . And inseam = 84.5 cm. As always I am betweeen S and M according to Canyon geo chart. What do You think after testing M size? Will it suit 179cm rider? What is Your saddle height (measured from center of bottom bracket to top of saddle)? Same reflection. That's why as an alternative I take into consideration Marin Gestalt 2 for 2019 with thru axles and all those mudguard mounts etc. I'm hoping that new 2019 Endurace models will have mudguard mounts as I need a new winter bike to get me fit again and an Aluminium 105 Endurace would be perfect. The 2018 ones seem to be virtually sold out so I am hoping it won't be long until the 2019 ones make their way onto my screen! Do you think the feeling of less snap is just from the heavier weight or do you think the bike isn't quite as stiff as the carbon version? Then my saddle height is 1cm lower than You - it is 74.5 cm . Wonder if it will look ok on M size frame. How many CMs You still have left to minimum seatpost insertion indicator? I have this bike, a great bike by the way. I would recommend these mud guards, I have them myself on this bike: SKS Raceblade Pro XL. Easy on/off, lightweight and highly customizable. Fits wheels up to 33mm (as mine). Works perfectly, and doesn’t look too shabby either if you ask me. Will Inflite accomodate Panaracers GravelKings SK or MUD 700x35 ? (according to reviews these tyre measure ~38mm in real on 23mm inner width rim).